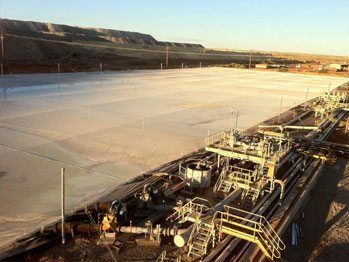 Commercial Netmakers is proud to design and produce quality, custom netting solutions for Australian mining operations. Pond nets are an important part of any mining operation’s strategy for minimising their environmental impact. By using our pond nets, you can ensure that you’re in line with your industry’s best practice guidelines. All mining operations produce potentially harmful waste products that need to be contained. The process of leaching, in particular, involves the use of processes and chemicals that must be contained. Leaching requires canals and ponds for the conduction and retention of liquid solutions pre- and post-treatment. It also requires lagoons for the final disposal of sludge or primary sedimentation. Our custom made environmental pond nets make this process safer by creating a permanent, effective barrier between these bodies of liquid and the environment. Stopping harmful chemicals from entering the environment is important. Not only can they cause problems for wildlife in the area, but they can also harm humans. There can be direct harm for workers on-site or more insidious problems such as tainting water supplies and the contamination of agricultural soil. One of the most efficient chemicals for extracting gold from ore is cyanide. Cyanide is used in both gold and silver mining operations and it presents serious health and environmental risks. The International Cyanide Management Code – usually called ‘The Cyanide Code’ – is a voluntary initiative that focuses on the safe management of cyanide that is produced, transported, and used for the recovery of gold and silver, and on mill tailings and leach solutions. By creating a barrier between cyanide in mining operations and the environment, permanent netting structures are an important frontline response for Cyanide Code compliance. When you choose Commercial Netmakers to create your custom made mining nets, you can be confident you’re getting a company that shares your commitment to the highest OH&S standards and values. We combine our capability with a commitment to the best products and services, which makes Commercial Netmakers the ideal partner. To find out more about our nets for miners, contact us today on (08) 9434 6000 or enquire online.